Never re-energize a transformer that has tripped on Over Pressure (Dev 63) without first performing IEEE routine test on the transformer. Most oil filled transformers over 1,000 kVA (mineral oil filled) are dual rated for temperature rise, 55C/65C. If the oil temperature is approaching 55C you still have room. If you are seeing quick spikes in temperature most likely this is a bad sensor/transducer/wiring but it is possible you have an intermittent short circuit. If this is the case you should see large current spikes say over 1000 amps. You may want to take a gas sample and perform a DGA (IEEE Std C57-104). This will tell you if you have arcing in oil. For an internal fault a rapid rise relay or sudden gas pressure device (IEEE Dev 63) that trips the primary breaker is common. Indirect measurement has two components, one is direct measurement of top oil by a sensor or a probe and other is measurement of winding current. A current transformer is placed on one of the three phases of untapped winding. This current transformer feeds current proportional to the load current in to a heater coil in the winding temperature gauge to provide additional deflection. This additional deflection corresponds to estimated or tested winding gradient. Additions of these two deflections, one of top oil sensor and other based on current transformer secondary current, provide the estimated winding temperature. So the accuracy of indicated winding temperature depends on the accuracy of current that is fed through the heater coil of temperature gauge. So please check the load on transformer if it is close to its top rating, if so, try to reduce the load. Also check what the reading of oil temperature gauge is. if it substantially lower than winding temperature, around more than 20 deg lower, than it is possible that current that is fed to the heater coil is not accurate. So I would suggest to check if load current on all 3 phases on both primary and secondary side is almost equal, compare them with the name plate current to see if one of the phase is drawing much higher current. As for tripping, trip on load side first and then if primary current is still high, trip on primary side also. 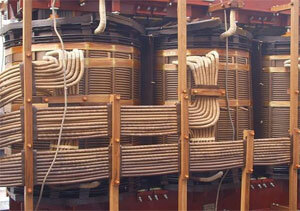 There are many reasons why the winding temperature could be high with the transformer at no load. For example, what happens if the fault is on the source winding of the transformer? This winding is energized even when your compressor is off. By your other posts it looks like you have the transformer energized even when the compressor is off. If the transformer has a faulty bushing, the heat will conduct down into the winding. If the transformer has a tap changer, it could have a dirty contact or a contact that is misaligned. The overheating could be caused by hotspots in the core which should (in theory) show up on the Oil Temperature Indicator first. It could be a faulty Winding Temperature Indicator but I think you may have an internal fault in the transformer.